The holiday season is not complete without a simple, easy to make, and fun to eat cookie! 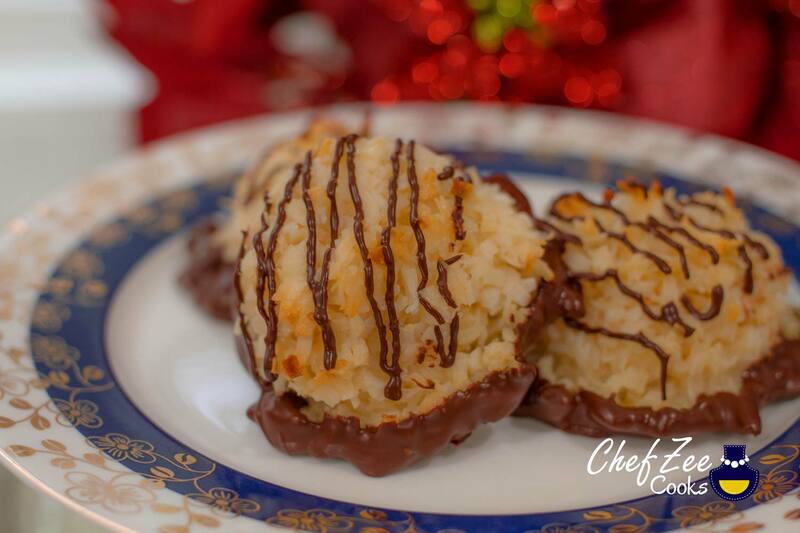 I love making Coconut Macaroons for this very reason! In fact, I even like to add a hint of almond extract to make me feel like I’m eating one of my favorite candy bars– Almond Joys. I love that this recipe has a few ingredients that are easy to find. I hope you enjoy this recipe and remember, you can always alter the recipe to fit your tastes. If you use a candy melt chocolate, the chocolate will set much quicker than if you use a high grade chocolate. High grade chocolate takes much longer to set. You can omit the egg whites if you like, simply add enough sweet condensed milk to hold macaroons together.